A Vega rocket lifts off with Morocco's Mohammed 6-B satellite on Nov. 20. Credit: Arianespace webcast. DALLAS — An Arianespace Vega rocket launched the Mohammed 6-B satellite for Morocco the evening of Nov. 20, placing the satellite in the same orbit as its twin satellite Mohammed 6-A that launched a year ago, also on a Vega rocket. 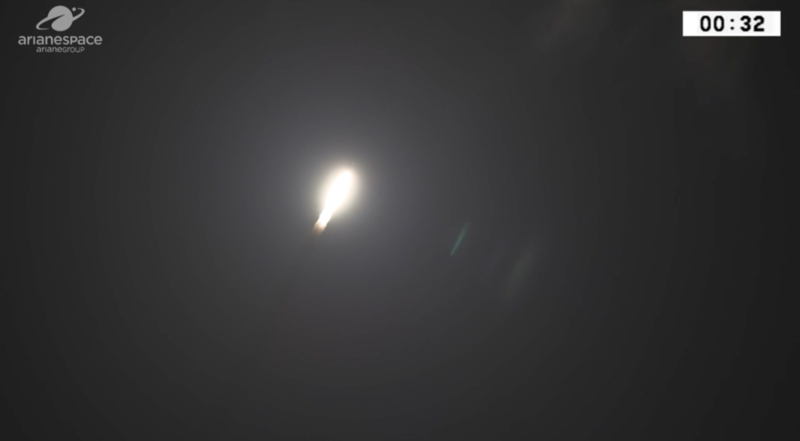 Liftoff occurred at 8:42 p.m. Eastern from the European spaceport in French Guiana on the northern coast of South America. The 1,100-kilogram satellite separated from the rocket in low Earth orbit about 55 minutes later. The launch completes Morocco’s two-satellite constellation for Earth observation. The country plans to use the satellites for purposes including land mapping, natural-disaster prevention and management, environmental monitoring and border surveillance. The Mohammed 6-B launch is Arianespace’s ninth mission of the year and second with the light-lift Vega rocket. Airbus Defence and Space built the satellite platform while Thales Alenia Space supplied the payload and the ground segment for image processing. Vega now has a track record of 13 launches, all of which have been successful. Vega will not have any more missions this year due to delays earlier this year with the European Space Agency’s wind-mapping Aeolus satellite. Giulio Ranzo, CEO of Avio, the manufacturer of Vega rockets, said the delay of Aeolus from March to August pushed out a third Vega mission to next year. “The schedule moved due to customer issues,” he said in an interview. Vega’s next launch will be in late January or early February for the Italian Space Agency, Ranzo said. Arianespace’s next launch is of an Ariane 5 rocket in December with the Indian space agency’s GSAT-11 telecom satellite and the Korean Aerospace Research Institute’s GEO-Kompsat-2A weather satellite.